Recently some members of The CTbites team and I had the opportunity to revisit and sit together at Sugar and Olives in Norwalk to try out the new springtime menu. For those of you who have not yet visited (what are you waiting for?!) 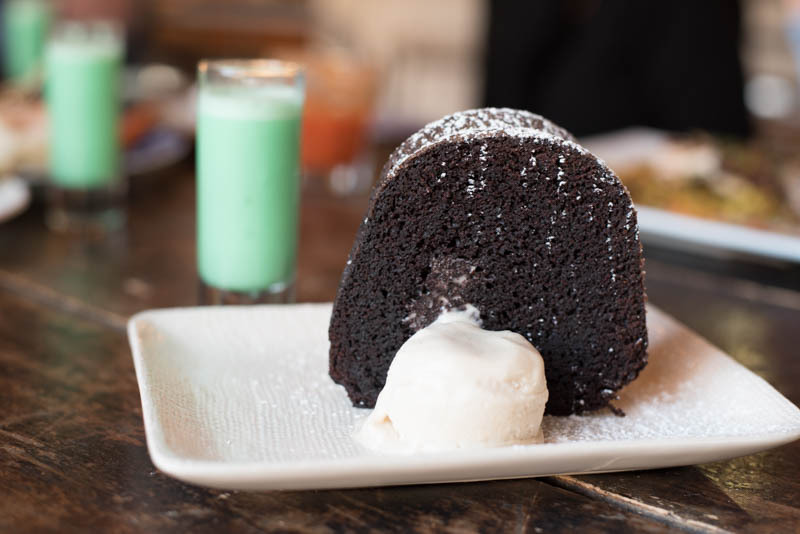 Sugar and Olives was established by Westport resident, Jennifer Balin, in 2008. Her goal was, and remains, to educate diners and cultivate the relationship between farms and families. She is committed to serving local food, and nearly all the items on the generous menu come from within the state, including milk, cheese, eggs, fruit, vegetables, beef, pork, poultry and fish, as well as wine, beer and spirits. This three star Certified Green Restaurant serves brunch five days a week and dinner three nights a week. We started off with a few appetizers. 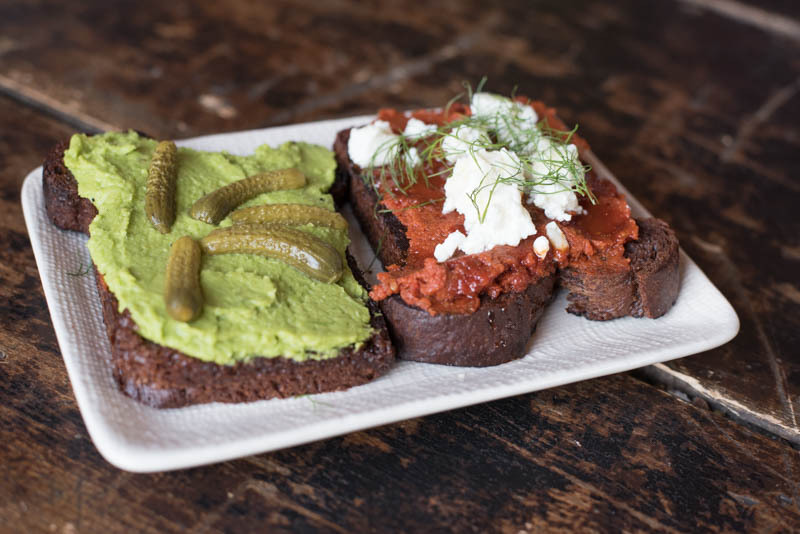 The chocolate bread toasts, made with house-made chocolate bread with organic flour and cocoa powder served as the bread for three separate toppings. The first had a wonderful tomato tapenade, Beltane chevre and agave, a perfect balance of sweet and savory. Next, a sunny duck egg from Speckled Rooster Farm in Westport was beautifully presented in the shape of a flower and sat on top of a layer of bacon jam, which also blended sweet and savory. The slight crunch of the bacon added a nice texture to the soft egg and bread. Last, but not least, we tried the pea and leek puree topped off with some thinly sliced cornichons. The toasts were each wonderful, creative and unique. We also had a rosemary flatbread with smoked bluefish pate and fennel fronds. The fish was delicious and smoked from a local catch; I’m a sucker for anything smoked, especially fish. I learned that the flatbread is mostly made by students in the cooking classes offered by Sugar and Olives on Wednesday nights. The rosemary, though mild, gave the crispy, cracker-like bread a wonderful flavor. I’ll order this and the rustic tomato and fennel soup the next time I go. The soup, always vegan, tasted as though it had been hand-picked from the garden that morning. Light and wonderfully flavorful, I thought this soup to be insanely delicious. It should be noted that I do not like tomato soup. I initially mistook the escarole and anchovy salad with Pecorino Romano cheese for Caesar Salad and I was corrected, but its flavors are reminiscent of the popular choice. The escarole, heartier than Romaine, holds up well to their dressing made from anchovies and anchovy oil and Banyuls Vinegar, lemon zest and honey. This particular vinegar is a cross between balsamic and sherry with notes of vanilla, walnuts, spice bread and licorice. It is made from wine from the Banyuls-sur-Mer region of France. Salty, nutty with a nice crunch from the escarole, this salad is hearty enough to be a meal on its own. But do not let that happen...you’d miss out on the rainbow trout a la plancha. 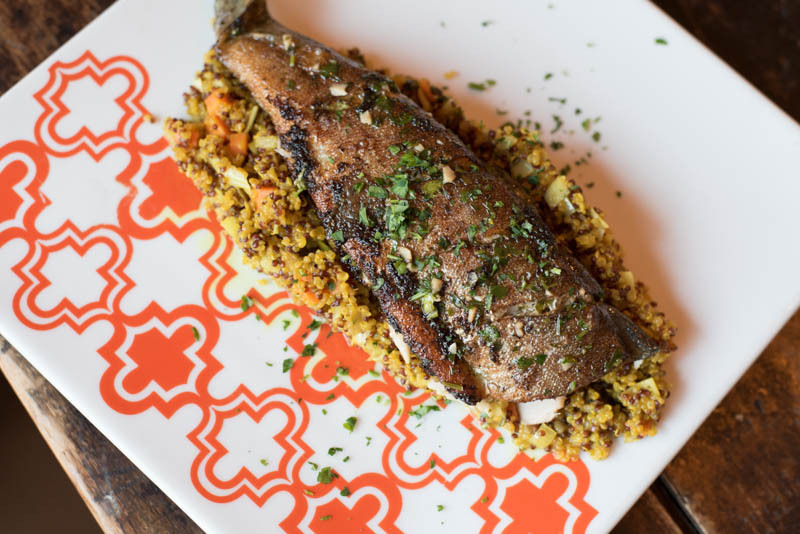 The trout, from Rowledge Pond Aquaculture in Sandy Hook, is served over quinoa paella with fennel, leeks and carrots and turmeric. This dish is light and aromatic. Another nice option is the burger, made from lamb from the Sepe Farm in Newtown. The lovely lamb burger offers a nice alternative to the traditional beef burger. With fresh parsley, sea salt and white pepper, ancho chili ketchup, caramelized onions and Maytag blue cheese the burger is served up on a house-made English Muffin with carrot fries. I particularly enjoyed the Asian inspired sweet and sour duck. Perfectly cooked, the duck is accompanied by tender roasted parsnips, rutabaga and other roots with an orange gastrique. 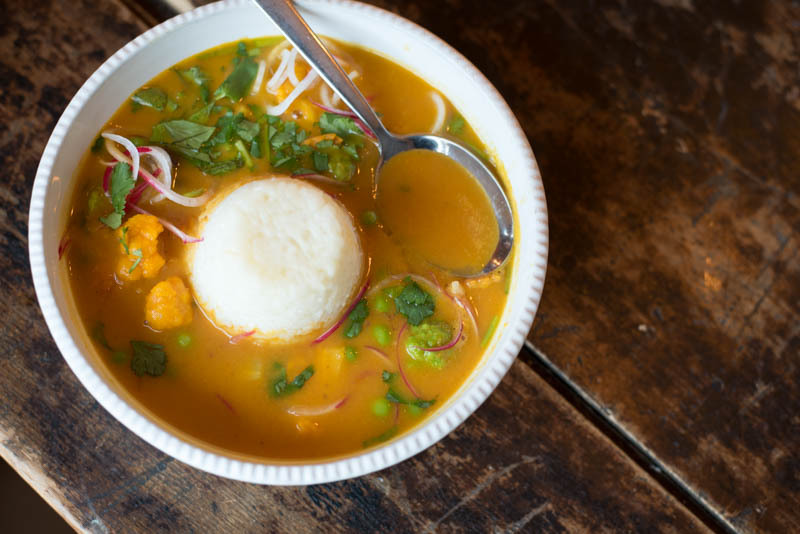 With Indian-inspired flavors the hippie chic pea curry bowl (seen above) is a vegan base of sweet potatoes, coconut milk, ginger, lemongrass and carrots, with jasmine rice, radishes, tri-colored cauliflower and cilantro. It is easy to see why this is one of their most popular dishes. Wonderfully exotic, and yet comforting, this was one of my favorites as well. I do think it was the sticky toffee pudding, moist cake with dates folded in and rich toffee sauce and chantilly cream, that captured our attention and stole our hearts. Our eyes may have rolled back in our heads. I may have done my best Meg Ryan imitation - Yes, that scene! This is worthy of every sugary calorie. I’d be remiss to write about Sugar and Olives without mentioning the wonderful cocktails we sampled courtesy of bartender, Chris Grimm. 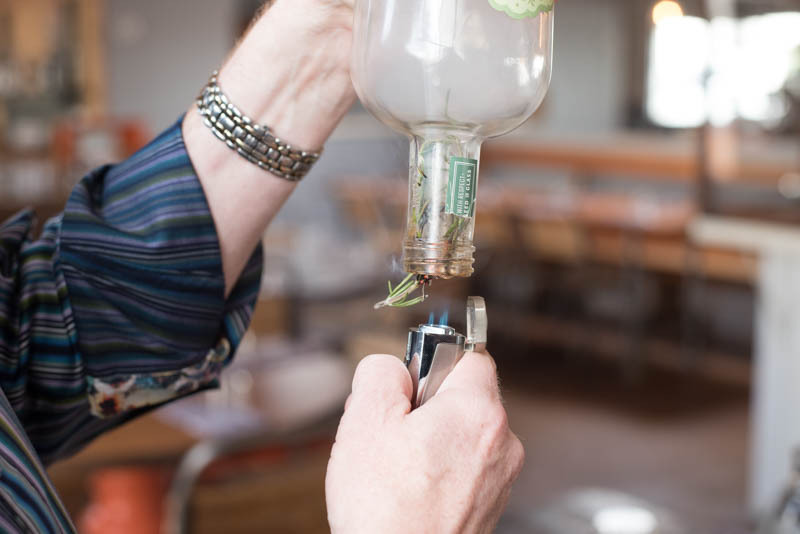 The brushfire, made from a rosemary smoked prairie gin (live footage above), lemon, simple syrup and chambord was wonderfully smoky with a hint of sweetness. This went down smoothly. For those who appreciate a strong aperitif on the bitter side, the chet baker is just that, made from barcelo dark rum, sweet vermouth, angostura bitters, Red Bee Honey and simple syrup. The beet blossom had a beautiful jewel-like color and offered a creative twist on a typical gin cocktail. 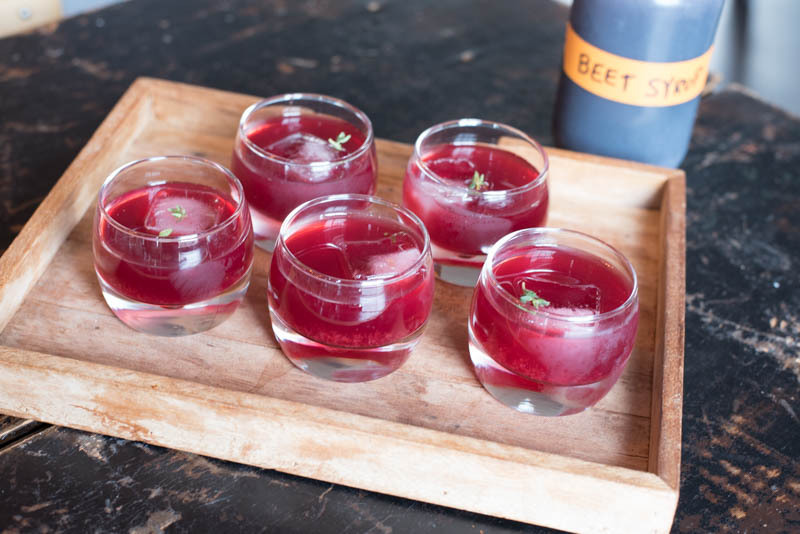 Made from beet syrup, prairie organic gin, and lime juice this drink has a slight earthy flavor. The grasshopper, made from creme de menthe, creme de cacao and half and half was like a vibrant green dessert in a glass. At Sugar and Olives you’ll be charmed by everything from the warm and rustic decor to the creative and diverse menu that was written to appeal to the senses and to entice diners to order something they might not otherwise (such as the lovely lamb burger). It is also meant to highlight the incredible offerings found in CT from the escarole to the chic-weed and the kohlrabi to the rhubarb and the kale, and it does just that. Slightly off the beaten path from the hectic Post Road, you’ll be awfully glad you chose this road less travelled. Cooking classes are also held every Wednesday evening. A couple of years ago the restaurant expanded and now offers a charming party venue and community hang-out. The restaurant can accommodate up to 225 guests, with two quaint smaller spaces for more intimate gatherings.